I just love that quote....it really does capture what assessment is all about...at least for me. I find it really hard to grade the writing of the children that I teach. They put their little hearts on the page....so who am I to judge what they have to say or how they have said it? 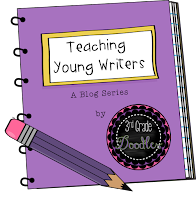 But in order for my students to become better writers, I must learn to evaluate their writing and give meaningful feedback in a way that pushes them forward in their journey as writers. It is a means to an end. 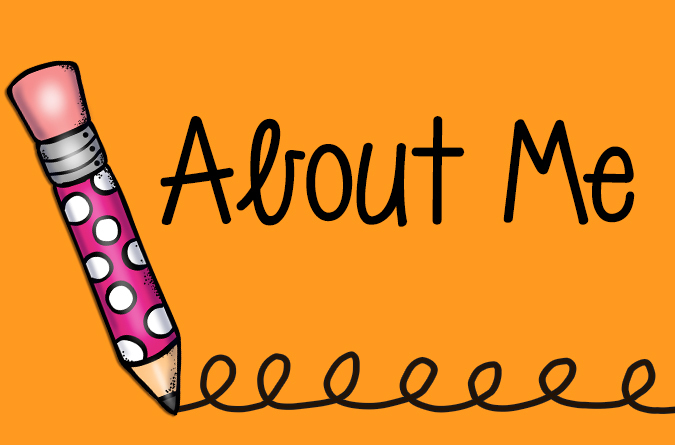 Writing is such a powerful tool and I want my students to sharpen their skills (and their pencils) so that they may see themselves as writers...and from that, find their voice in school and in life! 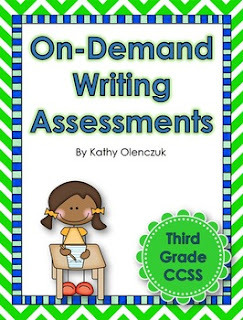 Our school district has adopted the Writing Pathways program, by Lucy Calkins, for assessing student writing, so that resource is highlighted in this post. However, the elements of your scoring kit can come from whatever resources that you use in your school district. I have some things that I will gift you in this post and some suggestions for where you might find resources if you are starting with nothing. Your students just spent an hour in class completing their on-demand prompt. You are excited to see what they did! You pack that stack of papers into your adorable Vera Bradley bag to take home with you this weekend. On Saturday morning, you pour yourself a cup of hot coffee, grab a purple flair pen and place the stack in front of you. Crap! Where is that rubric? So, you head to the computer to find it, which is like finding a needle in a haystack. Once you have that, you can finally begin scoring. Right out the gate, you find yourself struggling to understand that darn rubric. Did she tell the story "bit by bit"? What does that even mean?! Did she show what happened to 'and in' the characters? Ugh! Five minutes in and you have the worst headache since the end of the first day of school...the year you taught Kindergarten! So, you gingerly rub your temples, place that stack back in bag (for safe keeping) and promise that you will give it another go....maybe next weekend. Trust me....I've been there! 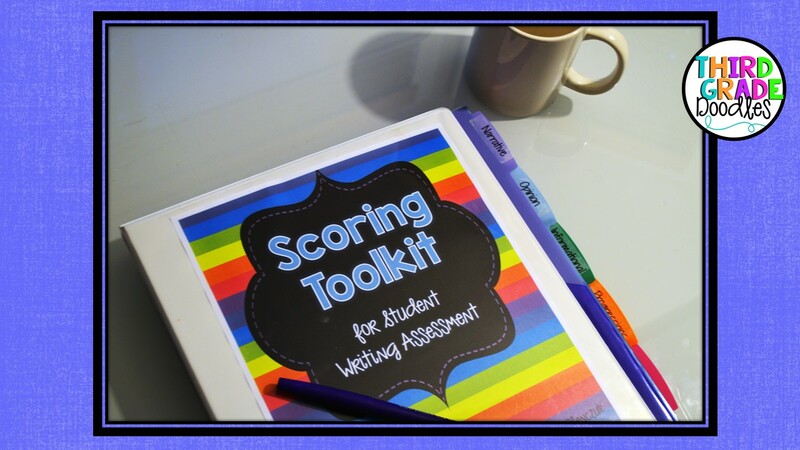 What I hope that you can accomplish today is to have the information and resources that you need to put together a scoring toolkit, so that when you sit down to score your students writing prompts this fall, you will have everything that you need in one place.....right at your fingertips....without the headache! Following is a list of what you will want to have in your toolkit and a brief description of each item and why its important. So let's get started! Your "toolkit" is basically a binder with tabs. 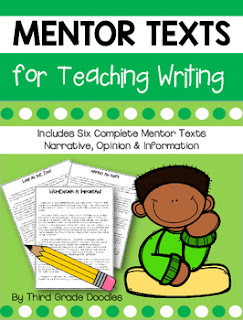 You will want a tab for each writing genre: Narrative, Opinion and Informational. You might also want a few extra tabs for extra stuff you add. I added one for the Progressions that come with Pathways because I find those extremely helpful with scoring. 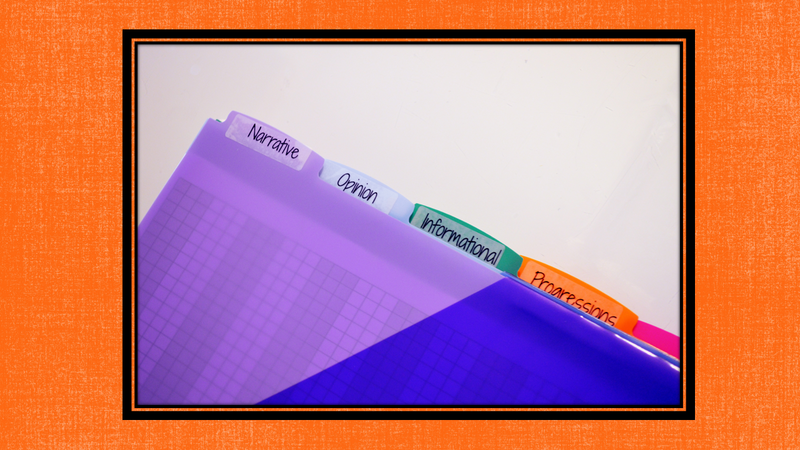 Behind each tab are all of the resources that I will use to help me to score my students' writing prompts: rubrics, student checklists, exemplars (student and teacher), scoring sheet, and a form for notes and strategy groups. 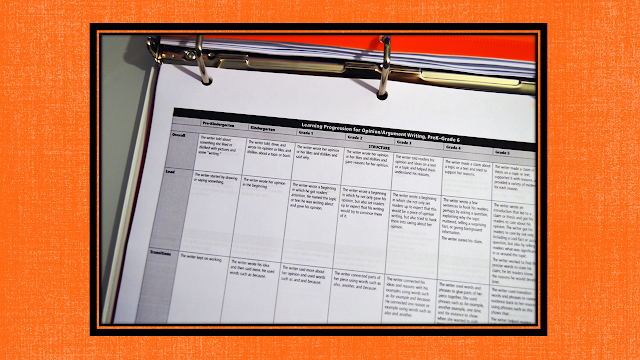 Obviously, you will want to have the rubrics that your school or district uses to score writing. 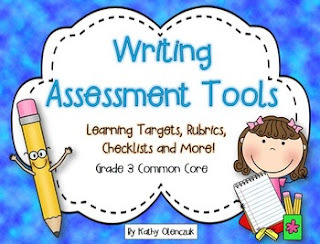 Pathways has a very consistent rubric for all grade levels that has helped our staff develop a common language for discussing and evaluating student writing. 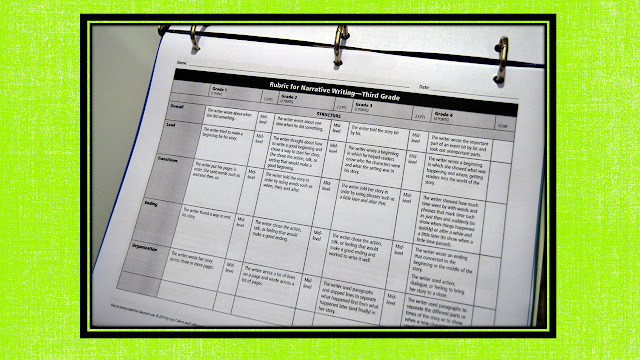 If you want to improve student writing at your school, a consistently used rubric is critical! If you have not adopted Pathways, I have a Writing Assessment Kit that contains common core aligned rubrics and checklists that you could use in a pinch (see the end of the post for more information). I cannot tell you how helpful these checklists have been in helping my students to set writing goals! They are also something that I can use as a reference when I score. The Pathways checklists are a kid-friendly version of what is on the rubric, and I love that they are illustrated! There is also a double checklist that you can use with students at the beginning of the school year that shows the previous grade's checklist and the current year non the same page! It is important to note that the checklist states the expectations for the END of the school year (so students have all year to get there). It is also helpful to have student exemplars, or good examples of student work that show clearly the items expected on the rubric. Pathways has some examples, but you certainly have access to plenty of your own! I try to make it a habit to keep a file of student writing to use for lessons. 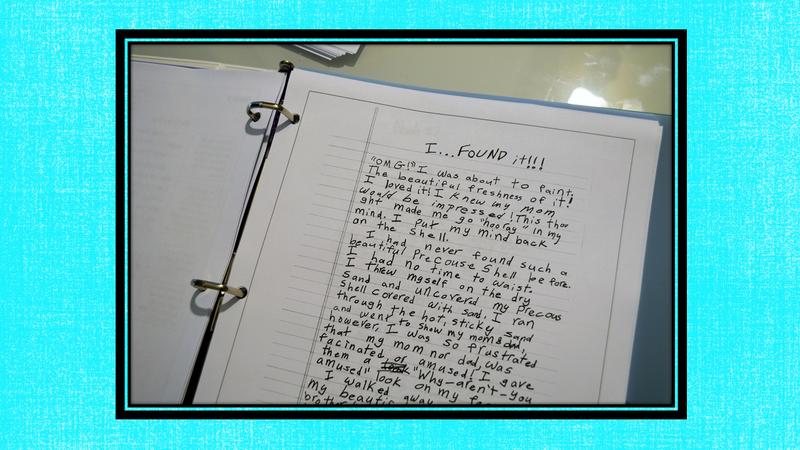 Our copy machine at school actually scans to a file, so it is super easy to copy a student's paper and keep it as a digital file for future use! 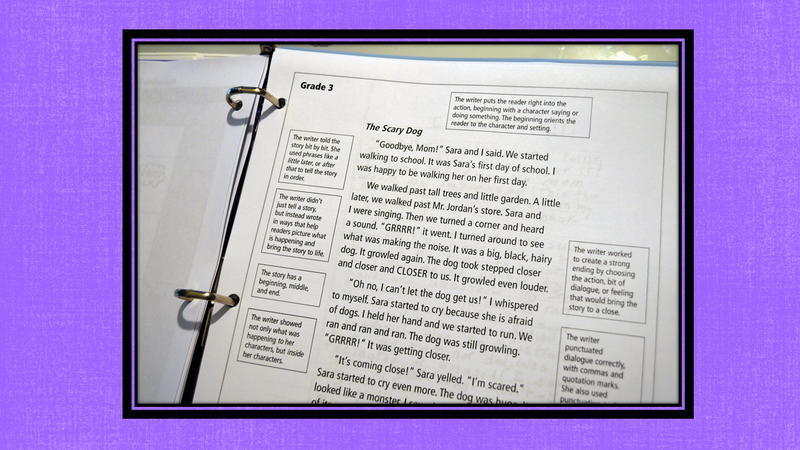 Our third grade team has a shared Google file where we share student writing exemplars....how sweet is that?! I have a form that I use to take notes on my students' writing. I like to look for class trends or group trends. For example, I might notice the majority of students in my class struggled with use of transition words. I make a note to do a mini-lesson on that soon. Or I notice that a small group of students are just not getting the structure of a personal narrative, so I will plan a strategy group for those kiddos. I keep a form for organizing some possible strategy groups as well. I find that if I don't write that stuff down as I score....it just might not happen at all! 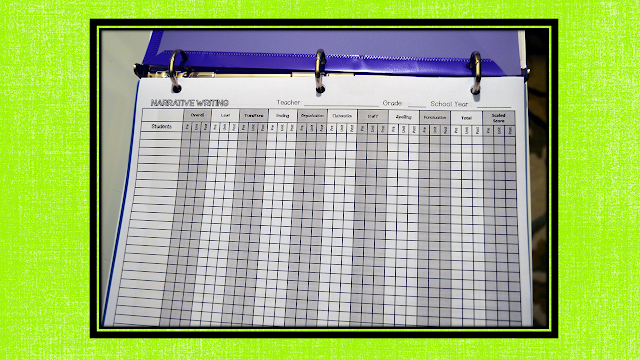 You will also need an organized way to record student scores. 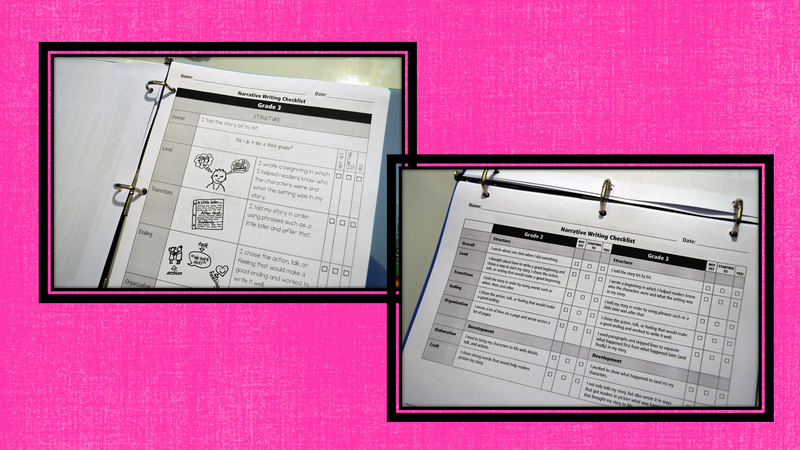 I like to record their score for each segment on the rubric, so that I can see those trends that I talked about above. Here is the one that I use....you can grab it HERE for FREE, along with the notes and strategy groups forms shown above. As I said, all of these reference pages go behind the genre tab in your toolkit binder. You will have a tab for each genre and the corresponding pages behind each tab. 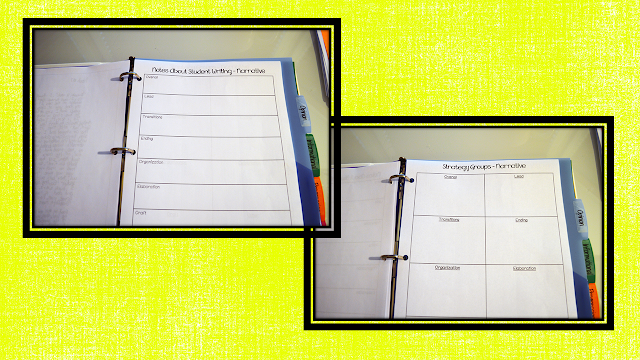 I added an extra tab for the Pathways Learning Progressions. These progressions show the expectations for every grade K-6, so that if your students are performing above or below grade level, you can pinpoint exactly where they are at! There you have it! I hope you have put together an amazing scoring toolkit! 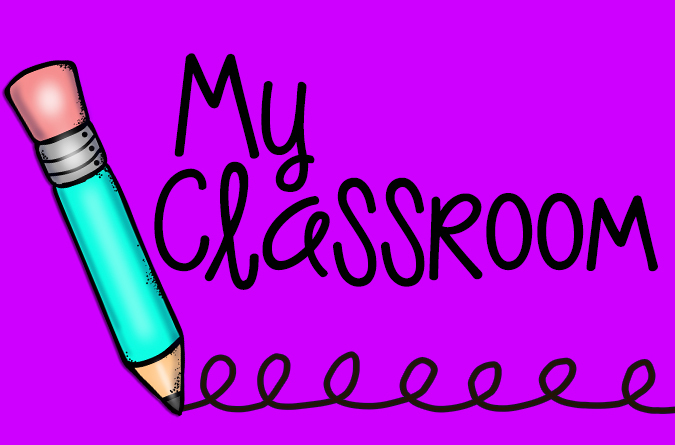 Now you just need a cute cover (I might have just included one in that FREEBIE mentioned above) and you will be ready to impress your grade level team (they will all want one)! If you are interested in learning more about Writing Pathways by Lucy Calkins, you can see the preview and purchase the book at the Heinemann site. I promise you that this is NOT a paid advertisement. LOL! 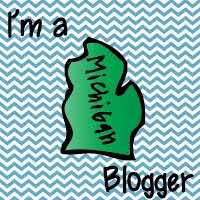 I have one of these for fourth grade too! 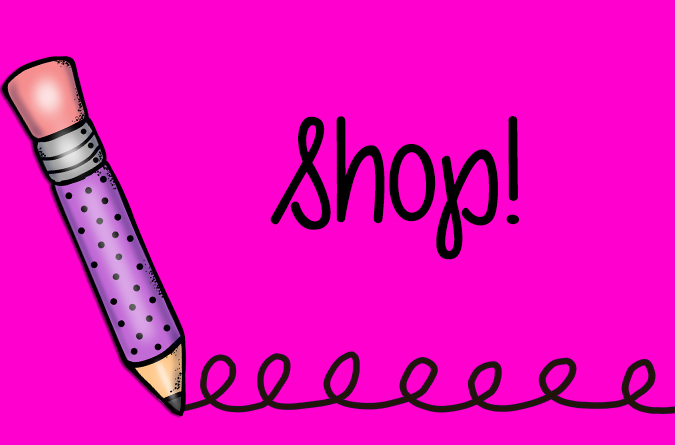 If you haven't subscribed to Third Grade Doodles yet, I encourage you to do so....you will get updates about new products and free stuff. In fact, just for subscribing, you will receive a cool FREE GIFT! Look for the SUBSCRIBE widget in the side bar! 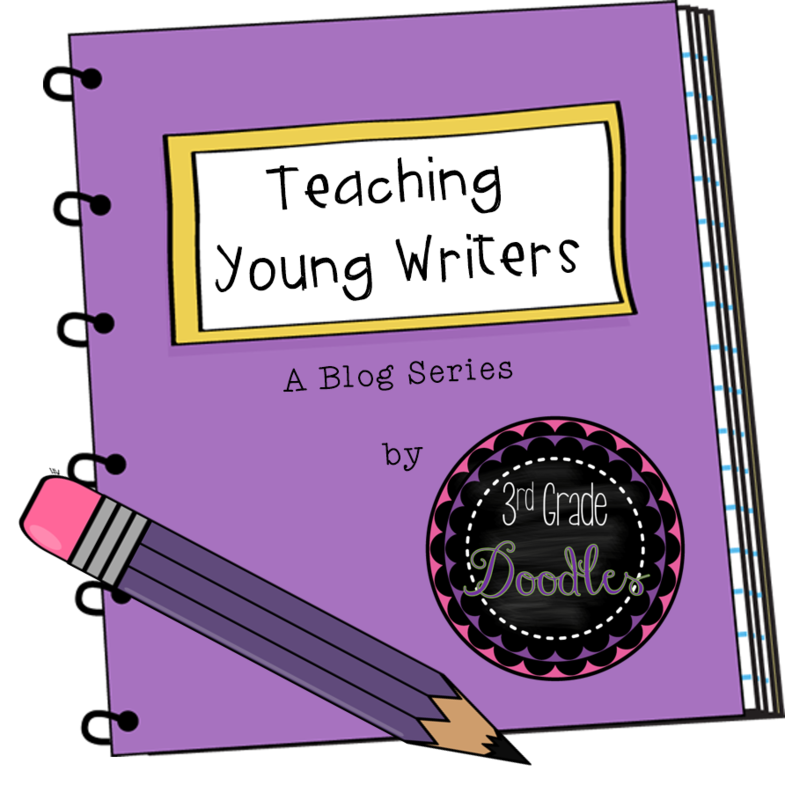 Also look for other posts in this series about Teaching Young Writers!